This morning, the two major American motorcycle companies combined are worth more than $1.5 billion less than they were Monday afternoon. Tuesday was not a cheerful day for Harley-Davidson, Polaris Industries, their investors, or some of their employees. Both Harley-Davidson and Polaris, the company that builds Indian motorcycles (and formerly Victory), announced quarterly earnings Tuesday morning. Harley's stock dropped about eight percent as the company's sales continued to slide, and Polaris shares plunged about 13 percent. The news wasn't all bad, but it was bad enough. Harley-Davidson stock gapped down on the news Tuesday morning and did not recover. It's easy to look at the headline number and think Harley's fourth quarter was a disaster, with fourth-quarter net income down 82 percent from a year ago, but that's partly due to a one-time charge because of the new tax law and costs for a brake issue. It's better to describe Harley's results as soft than as a collapse. Those hit hardest by yesterday's news were the 800 people who work at Harley-Davidson's plant in Kansas City. By the middle of next year, the company will close the factory, which was built in 1998, and consolidate that production into the York, Pennsylvania plant. (A facility in Australia employing 100 is also being closed.) 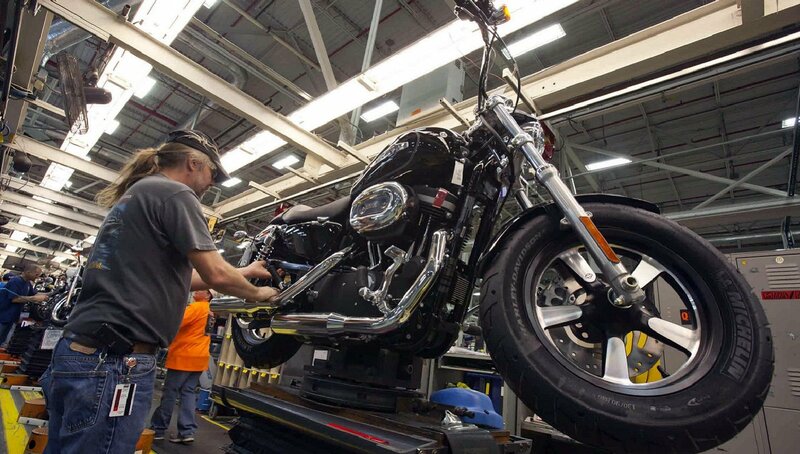 About 450 jobs will be added in York, Harley executives said (and both numbers are total workers, including full-time employees, casual workers and contractors). The company doesn't need the manufacturing capacity because sales continue to shrink. For all of 2017, Harley-Davidson sales fell 8.5 percent in the United States and 3.9 percent internationally. Even more importantly, Harley-Davidson's leadership doesn't expect that to change suddenly. "Looking forward to 2018, we expect international retail growth," said Harley-Davidson CEO Matt Levatich. "However, we don't expect a reprieve from the challenges in the U.S. motorcycle industry." Official company projections call for Harley-Davidson to ship between 231,000 and 236,000 motorcycles in 2018, down from 241,498 in 2017. Why are sales weak in the core U.S. market? It goes back to many of the same factors Common Tread readers have discussed in the comments section of previous stories: with stagnant wage growth and high debt levels for many consumers, new motorcycles just cost more than most people can afford, and young people aren't taking up riding in sufficient numbers to replace aging Baby Boomers. "Bike pricing is a headwind to new bike sales," said company CFO John Olin. "Year-to-date sales of used Harley-Davidson motorcycles were up through November and continued to perform significantly better than new retail sales in the United States." The Kansas City factory, where Sportsters were built, among other models, will shut down in 2019. Harley-Davidson photo. On stories like this one, I sometimes see comments from readers who question the intelligence of Harley-Davidson's leadership. Don't they see their core customers are aging out of motorcycling? Of course they do. I've heard Harley executives talking about it for 15 years. Solving that challenge is more difficult than identifying it, however. From the V-Rod to the Buell Blast to buying MV Agusta, Harley's attempts to branch out have shown mixed results, at best. The current approach is Levatich's mantra that Harley-Davidson doesn't build motorcycles, it builds riders. That's why the company is aggressively offering rider training and other options, such as rentals, to show people that riding is fun. Current efforts also follow years of work to attract younger riders, women, and other ethnic groups beyond the white, male Baby Boomer core customer. But as hard as Harley-Davidson is swimming, it's still slowly losing to the tide. Despite retrenchment elsewhere, Levatich reiterated previous promises by the company to bring an electric motorcycle to market next year. 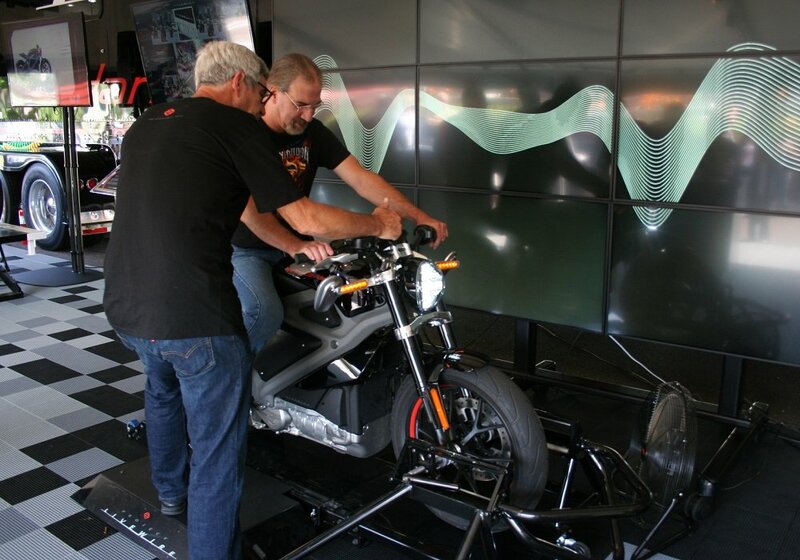 "LiveWire is an exhilarating, no excuses, electric Harley-Davidson. Over 12,000 riders told us so through the demo rides we provided around the world and it's an active project we're preparing to bring to market within 18 months," Levatich said. If you were questioning whether Harley would really go through with a battery-powered bike, Levatich put a stake in the ground. "We expect our increased commitment and investment in EV to help accelerate the development of this market and assure we are the world leader in the electrification of motorcycles, along with our continued leadership in premium, classic, custom and touring motorcycles," he said. Oops. Polaris' stock did an imitation of a cliff dive on Tuesday, as well. Despite the steeper drop in Polaris stock, the company's news was in many ways more positive than Harley's. Polaris continues making progress toward reducing the wave of quality issues that led to recalls, mainly with off-road vehicles, and hurt the company financially. In motorcycle news, Indian sales continue to grow, the company is progressing with the wind-down of Victory and even Slingshot sales (which are counted in the motorcycle segment) rebounded nicely. The problem for Polaris is not motorcycles, specifically. After all, the motorcycle segment only accounts for about 16 percent of Polaris' revenue. But the problem is related to the same forces that hurt Harley-Davidson: mainly, slow to non-existent growth. Overall, the company expects sales to increase by just three to five percent this year, while analysts were expecting more like nine percent. The company also predicted 2018 profits would be lower than analysts expected, and that led to the selling in Polaris shares.